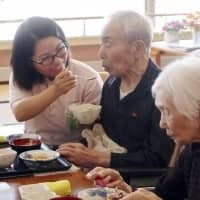 ASAHIKAWA, HOKKAIDO - Chen Wan-xuan, a student from Taiwan, raises a spoonful of salad to the mouth of an elderly resident at a nursing home in Asahikawa as she speaks quietly to him. “Please eat this slowly,” the caregiver says in clear Japanese to the man, who is in his 90s. “It’s delicious,” he replies, breaking into a smile after chewing some finely sliced radish. Chen, 28, is one of a number of foreign students in Hokkaido who will receive loan-based scholarships this spring of ¥2.5 million per year to work as caregivers in areas facing serious labor shortages. 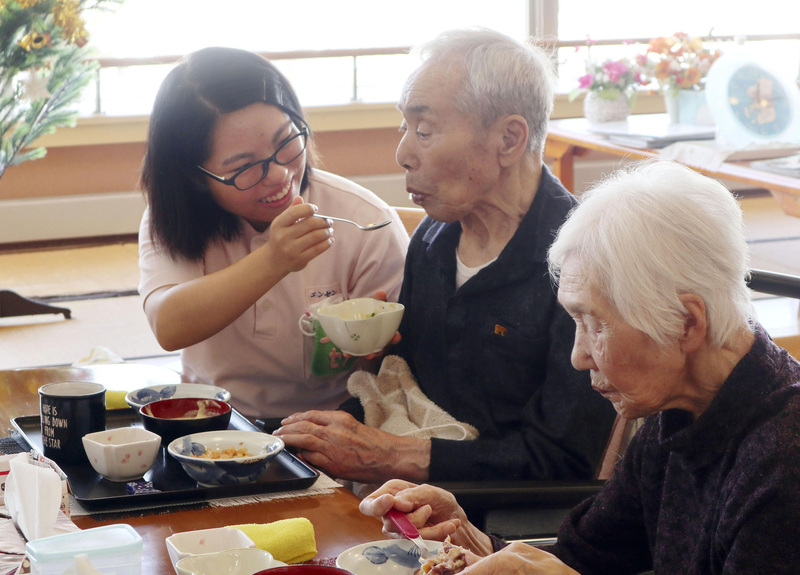 The initiative, a rarity in Japan, is aimed at attracting more foreign caregivers to areas outside major cities. Normally, new arrivals tend to work in large urban areas where they can earn better pay. In December, eight care facilities, three towns including Higashikawa and Chen’s school established a consultative body to create a scholarship for foreign students at the school starting from April. Of the ¥2.5 million provided annually to each student, 80 percent will come from tax revenue collected from the state and distributed to the prefectural government. 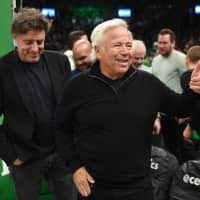 The students will be exempt from repaying the money as long as they work for a designated care facility for three to five years after graduation, with the length of time they are required to stay dependent on where they are working. Although there have been cases of municipalities providing scholarships to international students in the past, “I have never heard of one person getting such a large scholarship of ¥2.5 million per year,” said an official with the Ministry of Health, Labor and Welfare. According to Asahikawa Welfare Special School, there has been a sharp rise in foreign students applying to the caregiver program. Whereas there were just five applicants to the program in fiscal 2018, the school expects 25 to 30 applicants from April. “If I have the scholarship I will be able to really focus on my studies,” Chen says. Ichiro Matsuoka, mayor of Higashikawa, also welcomes the scholarship initiative. “We want to produce caregivers who are highly communicative,” Matsuoka says. 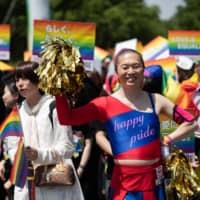 It is estimated that the nation will have a shortage of about 340,000 caregivers in fiscal 2025, and the number of Japanese signing up to caregiver schools continues to fall. Enrollment by Japanese in caregiver schools dropped by more than half to 5,714 in fiscal 2018, compared with five years ago, according to the Japan Association of Training Institutions for Certified Care Workers. In contrast, enrollment by foreign students continues to rise, having shown nearly a twofold bump in fiscal 2018 from the previous year to 1,142. 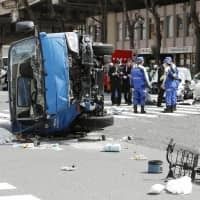 Even so, about 40 percent of registered foreign caregivers work in Tokyo and the prefectures of Kanagawa and Osaka, according to the Social Welfare Promotion and National Examination Center. Gunma Prefecture has been offering Japanese courses for foreign caregivers since April 2017 as a way of enticing them to remain in the rural area. The prefecture started providing annual subsidies of up to ¥1 million to caregiver schools for language support and extracurricular activities from April 2018. A new visa system starting in April aims to attract foreign workers to labor-starved sectors, including nursing, construction and farming, which are identified as suffering from labor shortages amid the nation’s aging population and falling birthrate. The introduction of the system represents a major shift for Japan, which had effectively granted working visas only to people with professional knowledge and specific skills, such as doctors, lawyers and teachers. The number of foreign workers in the country tripled over a decade to a record 1.46 million as of October. Under the new visa system, Japan will accept around 345,000 workers over the next five years. The nation reached an economic partnership agreement with Indonesia to bring care workers and nursing candidates to the country in 2008, and later inked a similar deal with the Philippines and Vietnam. A change in the immigration law opened the door for foreign students who train at Japanese care facilities and pass a national board examination to live and work in Japan indefinitely under the kaigo residence status. Care workers were also added to the technical trainee program in the field of nursing. By providing the new visa status from April, the government has said it expects to accept up to 60,000 caregivers over five years — a projection some experts call overly optimistic in the face of competition from other countries, such as Germany, Singapore and the United States, which also have a shortage of care workers. Yoko Amari, representative director of the Overseas Carers Development Association, pointed out the importance of building a support network for foreign caregivers in their communities. “It’s very important to involve local residents to establish a life support network,” she says.